2013 Tristar TNA Impact Glory wrestling cards deliver the first on-card TNA autographs since the company took over the license in 2008. The configuration is largely the same as previous sets, but that one change offers a big boost to one of the most comprehensive lines in the hobby. Like previous TNA products from the card maker, 2013 Tristar TNA Impact Glory delivers plenty of ink. Every hobby box comes with at least three autographs numbered to 199 or less. One or more of these signed cards comes hard-signed directly on the card rather than the stickers TNA wrestling card collectors have become accustomed to. A multi-signature card is among the promised autographs as well. Cards come with several color-based parallels based on the foil. For many signers, these autographs are their first on-card autographs. At the very least, it's their first in some time. For Kurt Angle, collectors have to go back to 2005 Topps WWE Heritage. For Sting, one has to go all the way back to 1999 and his days with WCW to find an on-card autograph. Boxes come with a fourth hit that is either an event-worn clothing card or an autographed ring mat card. All are numbered to 99 or less. Signed mat cards use the canvas from Slammiversary 2013, which was held in June, 2013. 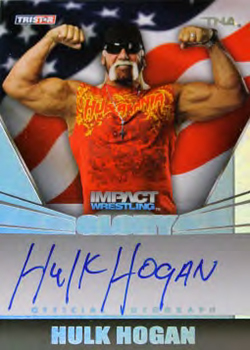 Among the memorabilia offerings is a shirt worn by Hulk Hogan on the July 4, 2013 edition of Impact. 2013 Tristar TNA Impact Glory hobby boxes also have one short print and two parallels numbered to 40 or less. Jeff Hardy figures prominently in the product. He is featured on special face paint cards taken from a TNA event. The former champ also created a piece of artwork used to make a ten-card puzzle. Former UFC standouts Tito Ortiz and Rampage Jackson have their first TNA cards in the release. Besides base cards, both fighters have autographs (including a dual autograph) and event-worn memorabilia cards. Every sixth box of 2013 Tirstar TNA Impact Glory wrestling cards is a hot box. These come with at least nine autograph cards, more than double the regular amount. Cases also come with a pair of randomly inserted autographed printing plates. SP cards also have unnumbered Gold cards. Really like the on card autographh cards. Steps up the value a lot. Great value in a box . Got a auto plate.